Having seen her Lugano fest close for lack of Swiss francs, the inspirational pianist has been asked to curate a festival of her own with the Hamburg Symphony. Martha will play four-hand with Daniel Barenboim and various chamber works with Mischa Maisky,Thomas Hampson, Ivry Gitlis and her own daughters, Lyda Chen and Annie Dutoit. Barenboim’s son Michael will also take part. The festival starts on June 25. Wonderful news! I’m certain it will be a big success with so many great artists. Nepotism writ large. Surely there exist plentiful of soloists the world over who could get hired in place of family, no? You say nepotism, I say ”artistic DNA.” I’m looking forward to see/listen to Martha Argerich playing with her daughters more that I’m interested in any recent prize winner or so. Talking of artistic DNA: I’m also looking forward to listen to the new DG release with Daniele Pollini. Wonderful photo in the article. Careful what you ask for; you may get it. There is no such thing as “artistic DNA”. Didn’t follow the Mozarts (although it did the Bachs). But that could have been more the product of parental education and nurturing than DNA. Anyhow, Argerich’s daughters will never rise to the level of their mother and funny how I wouldn’t be interested in hearing them. In fact, one of her daughters plays with her in the documentary film on the pianist and leaves the viewer with little to no impression. I don’t know who Daniele Pollini is but that’s like saying you look forward to the next Muti daughter opera production just because of daddy or Marta Domingo’s just because of hubby. And I don’t know Barenboim’s son either. What planet do you live on that you haven’t heard Michael Barenboim play? He’s an excellent and talented musician. And I’m sure the genes help! Michael Barenboim is a nerd – a good student at best. No talent. I agree with you with everything. The new recording of ‘En blanc et noir’ by Maurizio and Daniele Pollini is superb, even if MP’s performance is somewhat uneven in the accompanying Debussy Préludes, Book II. I don’t know if this has anything to do with ‘artistic DNA’, but I had to smile at Caravaggio’s straight-faced assumption that Pianofortissimo was literally referring to Deoxyribonucleic acid, or perhaps taking a stance re nature v. nurture. Since he’s taken P’s lighthearted phrase seriously, let me add that our current knowledge of genetics indicates DNA most certainly can play a role in the transmission of factors conducive to musical ability, but would not be expected to in many or even most cases since children inherit equally from each parent and are also subject to a small but significant number of mutations. Furthermore, those factors may well not ripen into musical development without education and nurturing on the part of parents or others in the young child’s environment. By the same token, education and nurturing alone rarely result in a young musician becoming a great artist or virtuoso, do they? To my ears, Lyda, Annie, Michael, and Daniele may well have gotten a bit more than nurture alone from their parents. I mean Daniele Pollini’s solo album (Chopin’s Etudes op 10, Scriabin’s late works, and Stockhausen’s Klavierstück IX). artistic DNA? there’s no such thing. if there is, it’s overestimated. if there’s such thing, then the world would not be missing so much of great talents, and there is supposed to be many heifetzs, Rubinsteins, gilelses, but, no, there’s still one pig them and no more. art takes hard work more than DNA, you need that drive to strive for perfection and unique, and that kind of drive, or passion doesn’t come from your DNA. Not really. It wasn’t nepotism when Emil Gilels recorded 4-hand Mozart with his daughter; it was marketing. This is the same: they are presenting a show, and people can choose to attend. Or not. Free market and all that. There is no requirement that Argerich assemble what to you would appear the “best” roster of artists. And maybe it didn’t occur to you that she is past 75, and would like to perform with people she knows and loves? If you don’t approve, fortunately there’s a simple solution: don’t buy a ticket. Vote with your wallet, as they say. The institution, Lugano-based BSI Bank, that sponsored Argerich’s Lugano Project for eleven-or-so years ceased operations. It was taken over, integrated, and subsequently dissolved by Zürich-based private banking group EFG International. A beautiful picture of the three great pianists. That reminds me of their great friend Claudio Abbado. My congratulations to the Hamburger Symphoniker, and especially personally to their Intendant Daniel Kühnel, who is known of making impossible things – possible. He brought to Hamburger Symphoniker Maestro Jeffrey Tate, who fantastically worked with the orchestra as MD in late period of his great career. 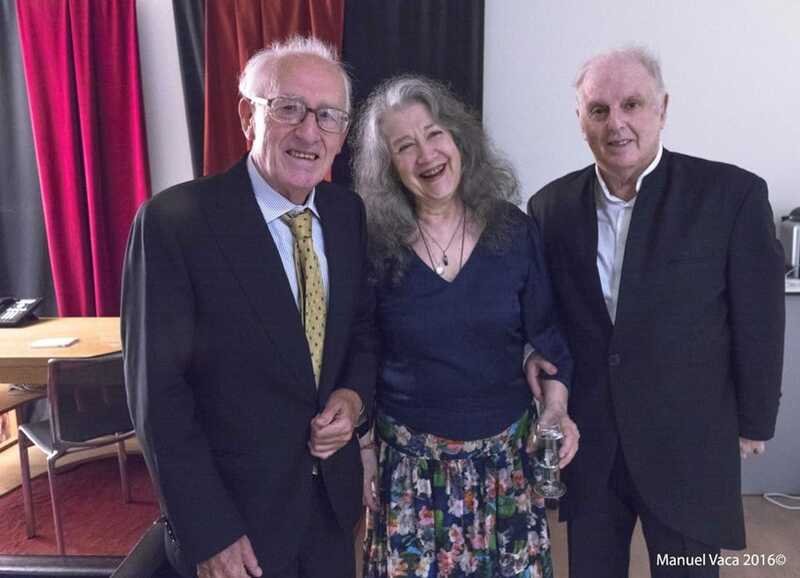 And now he is bringing to Hamburg Martha Argerich with her great friends. The program of the first edition of the festival ( hope it will be annual!) is very interesting, and promise many sold out concerts. Hamburg ( city I live and enjoy very much) seems to be another classical musical capital on the map of Europe. And not only because of the Elbphilharmonie!! Andrey, love your dedication to Tchaikovsky’s 3rd suite. Please program with Glazunov 4. Wish it could have been the REAL pianist, Freire, instead of the “sort of” pianist, Barenboim.